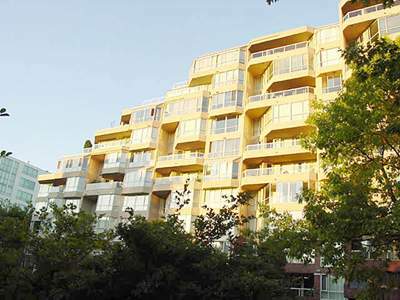 Newport Quay building – 518 Moberly Rd, Vancouver, BC, V5Z 4G3. Newport Quay was developed in 1986 on the Eastern side of False Creek. Newport Quay includes 158 Suites on 11 Floors, most of which are large 2 or 3 bedroom apartments ranging from about 1000 – 2000SF. Newport Quay apartments are very close to the seawall and Monk McQueens restaurant. From here, it’s a short bike ride away from Science World, Granville island and the Aquabus. There is a small sopping center on West 4th about 5 minutes walk from your Newport Quay condo. Each Newport Quay apartment will include in suite laundry, Ceramic tile in the kitchens, parking and storage. Many condos in Newport Quay have been updated over time to include hardwood or laminate flooring, stainless steel appliances and granite or marble counters.